These two countries and the main city in each have evolved in each their own way over the past thirty or forty years. Many of the details are interesting anthropological observations that would probably be difficult to trace to the root. In “very general” terms, Mikael describes the peculiar differences between bicycle riding in each country, from the Dutch preference for panniers and the Danish preference for front baskets to the different bikes used for hauling cargo in each location. These differences are small but noticeable, and any fan of livable streets who’s been to both countries can’t help but wonder when and how the two locations parted ways along the evolutionary trail. But here we are in New York City, standing at the dawn of our own biking civilization, so to speak, and we have the opportunity to watch one unique species take the very first steps on an evolutionary path that may define it for generations. That species is the bicycling parent. Carrying children on one’s bicycle is nothing new in New York City. People have been using things like the Topeak Baby Seat to carry very young kids for years. But something has happened as the city has grown increasingly safe and family friendly. Parents who want to continue bicycling as their families grow have to figure out the best bikes for carrying multiple kids, all the while doing the many things that parents do, from schlepping to school and soccer practice to grocery shopping and doctor’s appointments. If you want to carry a growing child or two and the supplies and provisions that go with them, the old Topeak seat just won’t cut it anymore. That was Phase 1 of New York’s evolution as a biking city. Judging by what I’ve seen recently, Phase 2 has firmly begun. 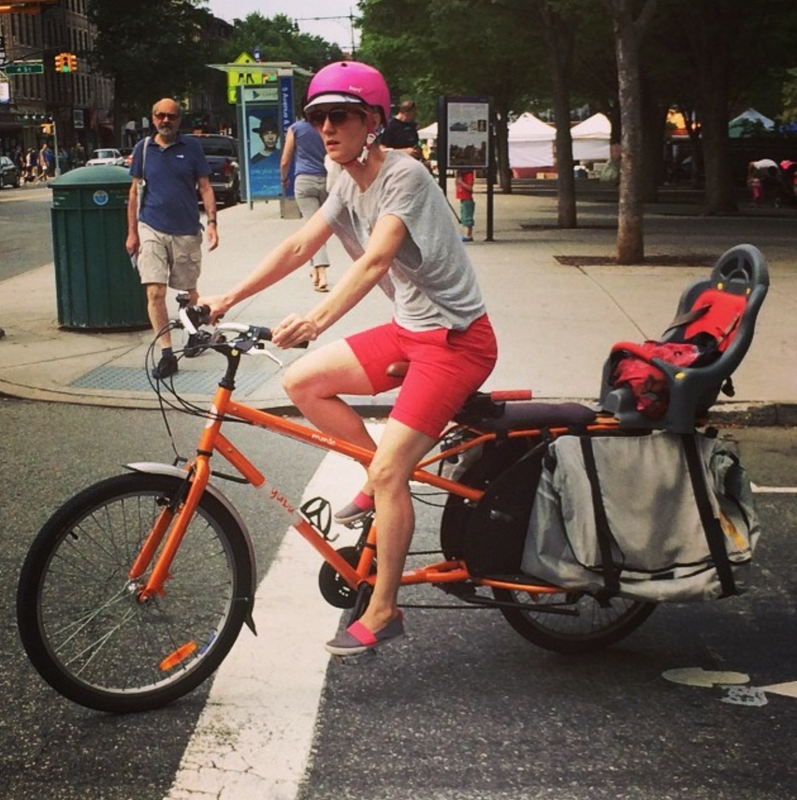 But rather than the Dutch bakfiets or the Danish cargo trike, the bike that’s taking hold among New York City parents seems to be the longtail. The longtail, as its name suggests, has an extended rear “tail” or longer wheelbase than a conventional bicycle, allowing for a long rack and more than enough space to fit two or even three children and, depending on the model, enough groceries to feed a family for a week. Popular models include the Yuba Mundo, Xtracycle, and the Trek Transport. Dutch versions such as the WorkCycles Fr8 — which I ride with my kids — and various models by De Fietsfabriek can also be spotted with increased frequency, thanks in part to Rolling Orange in Cobble Hill and Adeline Adeline in Tribeca. Like Mikael, I’m speaking in very general terms. One does see the occasional bakfiets here and there and I can recall seeing at least three cargo trikes around New York this summer. But longtails seem to be growing in number by the day. Just a few years ago one would have been hard-pressed to see two or three of these all year. But just this morning during my commute to work I saw three such bikes, likely fresh from summer camp drop-offs. Evolution on steroids, one might say. So why have these bikes taken root here? 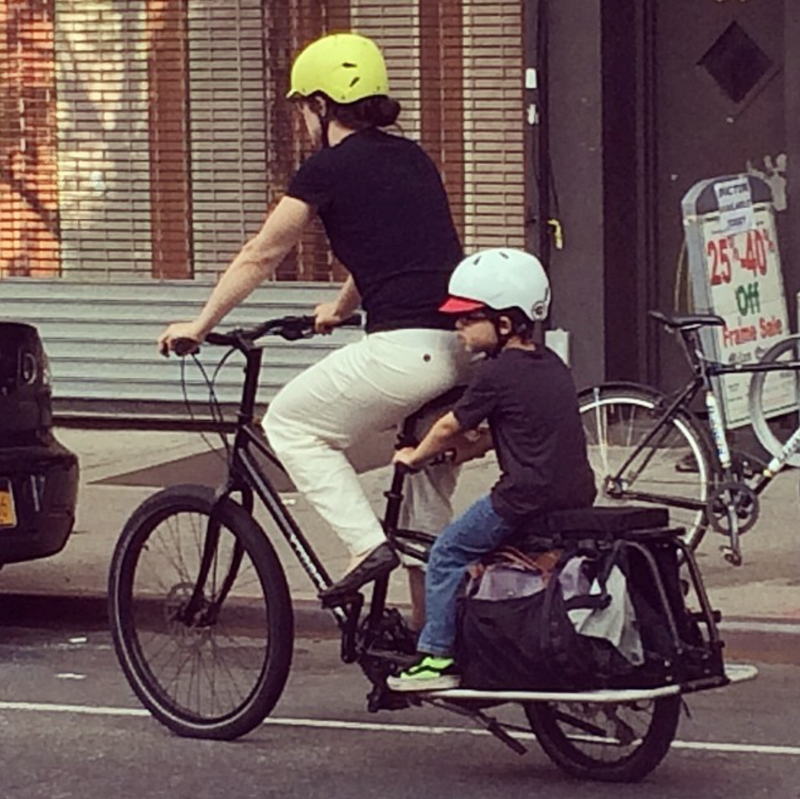 Why have New York City parents largely chosen these models over the kind of kid-hauling bikes their Dutch and Danish brethren prefer? First and foremost, it’s about the size. Lacking a large box in front, these bikes are lighter and easier to navigate through New York’s narrow, squeezed-by-cars bike lanes than a bakfiets. Dropping the kids off at school or camp and then heading to work is a piece of cake, whether it’s up and over a bridge or via a bike lane that’s frequently squeezed by motorists, such as Jay Street. Then there’s the parking. The threat of theft being what it is, New Yorkers like to park their bikes inside if they can help it, and a heavy bakfiets or cargo trike isn’t exactly the kind of thing that makes it up a brownstone stoop or through an apartment hallway very easily. Not that longtails are made of carbon fiber, but they’re not impossible to lift up and down a set of stairs. And for people who do have to leave their bikes outside, these bikes are no wider than a conventional bike, making them pretty easy to lean against a railing without being too obtrusive. 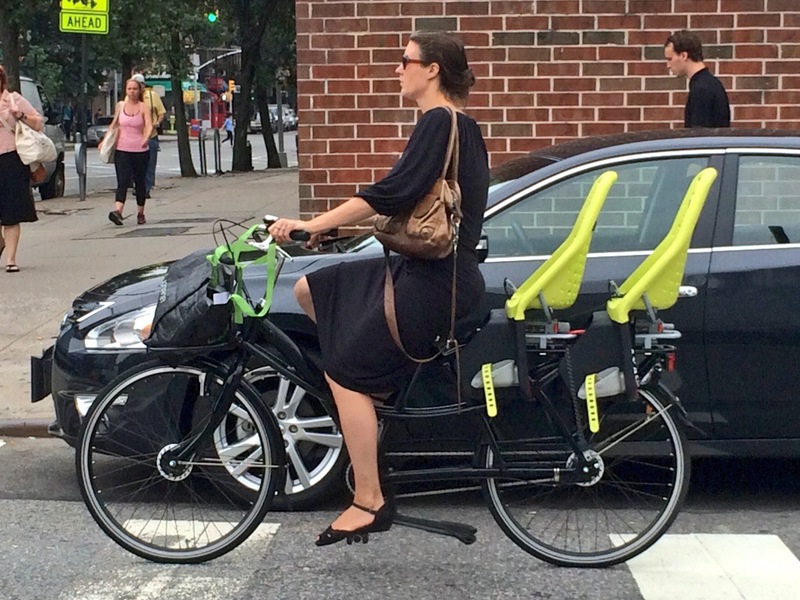 Until the city starts providing more on-street bike parking in residential areas — and making some of its secure in the form of bike cages or this Danish design — I don’t see how bakfiets or cargo trikes will ever have the chance to evolve into the mini van of choice for New York City parents. So there you have it. Evolution in progress. And you were there at the beginning. Let’s check back in 10 or 20 years and see what’s happened. ← The Bikelash is Dead, Long Live the Bikelash! I’m noticing more and more longtails too, Doug. I wondered whether the phenomenon was popular in New York partly because they’re a rough counterpart to an SUV that carries the kids and all their stuff. Certainly, at my son’s school, there’s a fairly neat division between kids spilling out of Cadillac Escalades and the like and those arriving on longtails. 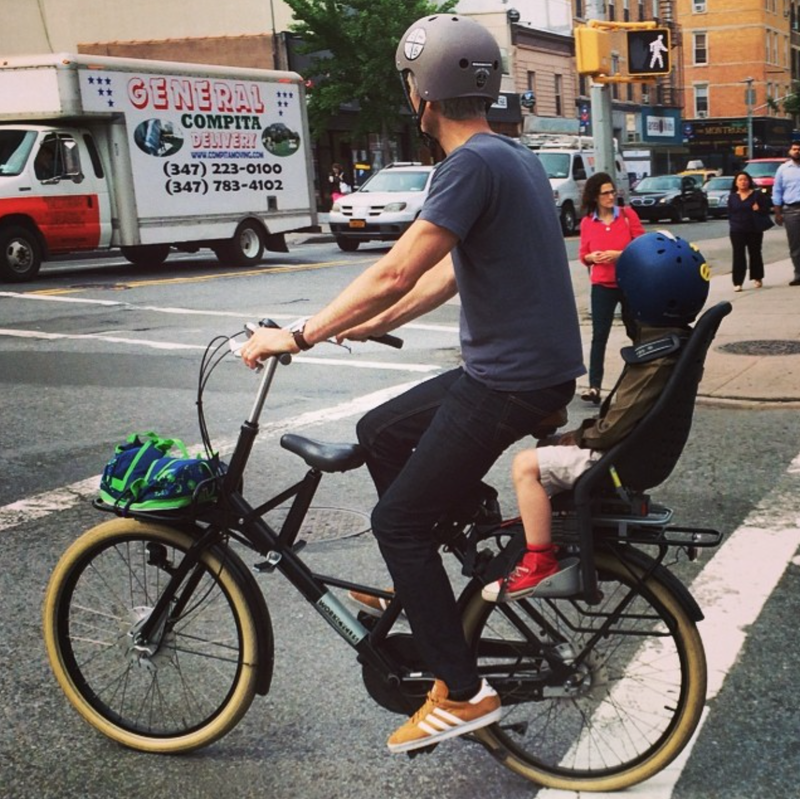 I’m seeing far less in New York than in London, where I used to live, of trailer bikes – bikes that attach to the adult’s bike and where the child can contribute some pedaling effort. My family have had great success over nearly nine years now with a Burley Piccolo trailerbike that first my daughter and now my son have used. I’m certainly glad when climbing the Manhattan Bridge and the like to have a little extra help from the extra weight I’m carrying. My wife and son are famous! (Second photo.) As much as we would have liked a bakfiets, there’s no way we could carry one in and out of our basement, as you say. We still get double takes when we’re out and about — and people almost always react positively. I was wondering when that would stop; I suspect in the next couple years. I just exchanged a few nice tweets with your wife! I’ve seen them a bunch of times around the neighborhood. I saw! Say hi next time! Actually, Nick P.– Of all the couples I know you, I actually have no doubt that both you & Charlotte (individually) *could* actually carry a bakfiets in and out of your basement given your Crossfit awesomeness. But yeah– the longtail makes lots of sense for your family. Go, Xtra Edgerunner. Don’t forget, longtails are cheaper than box bikes. Great point. Given the import costs on some Dutch and Danish bikes, longtails can easily be $1000 cheaper! I live in the DC metro area and I think the long tails are definitely the family bike of choice. I bought a Yuba Mundo in February to haul my two kids. I would have preferred a Bullitt but the Mundo was much less expensive. Also, your point about maneuverability I think is the key factor for why the long tail is the cargo bike of choice. Until American cycle tracks are more pervasive, long tails seem more practical. I still really want a bullitt. I also live in the D.C. area and have a Surly Big Dummy…for a while it seemed to be a rare site…but I am now seeing more and more longtails too! We live in Davis, CA, a v bike friendly place. You do see some lovely classic Bakfiets around town, but here longtail is also by far the “minivan” bike of choice. One issue in the US is that we need a bit more agility and power, since we are biking closer to cars than in Holland, where bike paths are separated. Even in a town with great bike infrastructure (for the US) you need to be able to brake or speed up quickly to dodge a car door, etc. The trailabikes Robert mentions are also insanely popular here. 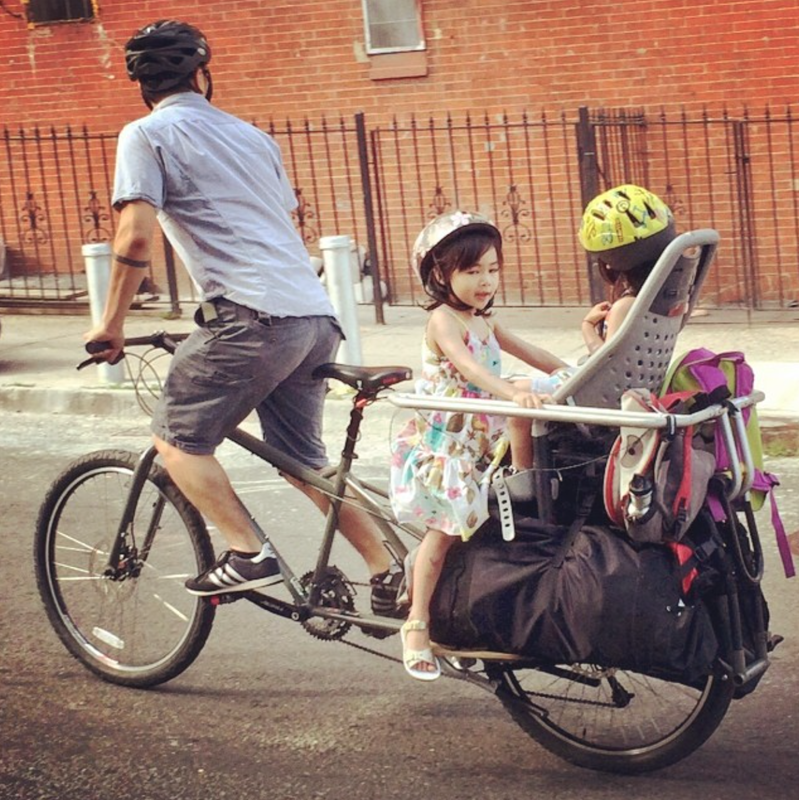 I love seeing all the rigged up bike-trains families create: a bike seat on the back+ (single or double) trailabike+ trailer with baby and/or dog and groceries…. I think the bike train is a particularly Davis creation. 🙂 I worked at B&L for a few years, and their front window gives a great view of the morning bike commute, and the varied array of bike trains, longtails, and “just” bikes rolling by. I live in Vancouver, BC, & I think longtails are catching on here too. I recently got a Yuba Mundo rather than a bakfiets–maybe because as you say, it’s smaller & lighter. For me that means I can fit it in elevators & take it on our light rail system (too big for bike racks on buses though). Plus, the gear range allows me to make it up hills with the kids & a Costco run. Not sure I could manage the terrain of this city on a bakfiets. Price was definitely a factor–even used Dutch bakfietsen go for a lot more than a new Yuba. I think how the bike handles makes a big difference too–my Yuba feels like a normal bike, though heavier. The times I’ve tried box bikes they handled pretty differently, especially the “Christiana Trike” style. Good to hear! I’m riding one here in New Zealand where they are still unusual. They are well suited to our roads though and could easily play a part in the cycling renaissance we are seeing here too. Greg, thanks for your comment. You’re 100% correct, of course, but for this post I decided to go with a more general definition of “longtail” instead of a manufacturer’s definition, opting to include anything that appears or is longer than a conventional bicycle. Since the Fr8, which I ride, has the optional long rear rack with space for two kids, I included it. It certainly allowed me to have a Dutch bicycle without having to worry about storage in the way I might with a bakfiets. I’ve seen some tweelingfiets around, which most likely are sold by Rolling Orange.